Chloe Finlay won the ladies race at the Peterborough 10k and finished second in the Peterborough 5K series. A field of 448 runners toed the start line for the first running of the Peterborough 10k held in Nene Park on Sunday morning (July 8). Whissendine Six winners Hannah Chapman (Ieft) and Brian Corley (right). Peterborough AC’s Sarah Caskey was third in 42.13, five seconds clear of Caroline Woods of Yaxley. In the men’s race unattached athletes Ruslanas Seitalijevas, Vitas Gapsevicius, and Steve Jennings took the top three positions with the winning time being 36.58. Bushfield Jogger Scott Meadows finished fourth in 38.19, while Nene Valley’s Luke Myers finished sixth in 38.41. Lincoln Wellington AC’s Jake Richardson and Nene Valley’s Jordan Foster picked up their second wins of the Peterborough Grand Prix series, in the third race at Ferry Meadows on Wednesday. One more win in the final two races will be enough to ensure that Richardson is this year’s champion, and the former Nene Valley star won in a time of 15.39 with BRJ’s David Hudson in second place 13 seconds further back. Shaun Walton of Peterborough AC was third in 15:54 with Coventry Godiva’s Amittai Ben-Israel fourth with a 16.03 clocking five seconds ahead of Peterborough AC’s Steve Robinson. Things are not quite as straightforward for Jordan Foster, as the ladies final standings are based on their positions in the whole field. Nevertheless, with two wins she currently sits in pole position. Nene Valley youngsters Molly Peel and Ella Robinson were fourth and fifth with clockings of 19.02 and 19.16 respectively. The junior 3k race was won by Nene Valley’s Kai Chilvers in 10.12 with Katie Tasker, also of Nene Valley, the first girl home with in a time of 11.28. Brian Corley had a night to remember in Rutland last Friday as he picked up a rare race win in the Whissendine Six. 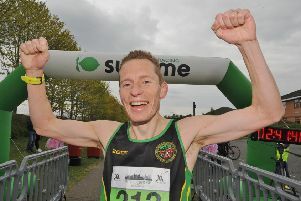 Bushfield Jogger Corley led from the off and crossed the line in a time of 34.03 beating Jason Barton from Melton Mowbray-based club Stilton Striders by some 39 seconds. Phil Martin of Peterborough AC was third in 34.49, and, on what was a good day for Bushfield, Martin Gichuhi was fourth in 35.10 with Stamford Strider Mark Popple eight seconds further back. There was also local success in the ladies race which was won by Peterborough AC’s Birmingham University student Hannah Chapman in a time of 39.49, an improvement of four minutes on her time in the same race last year. Yaxley’s Anna Devine was third in 42.41 with her teammate Gina Crane fifth with a 43.26 clocking.